Beginning with a deep understanding of what youth need to succeed, teachers and principals are engaged to envision new possibilities in their traditional roles and take the initiative to lead the transformation. They do this by challenging the status quo, modeling the change they want to see and engaging others in bringing our initiatives to their schools, with the goal to empower students with the values and competencies needed to be successful in today’s world. Our country teams work at the grassroots and national levels with individual schools and communities, as well as Ministries of Education and other key changemakers to implement signature initiatives such as the Character and Creativity Initiative and Leap Hubs. Our international team works at the global level, connecting educators through local, regional and global events and online. The result is a vibrant and active community of engaged individuals and stakeholders who are passionate about transforming education. 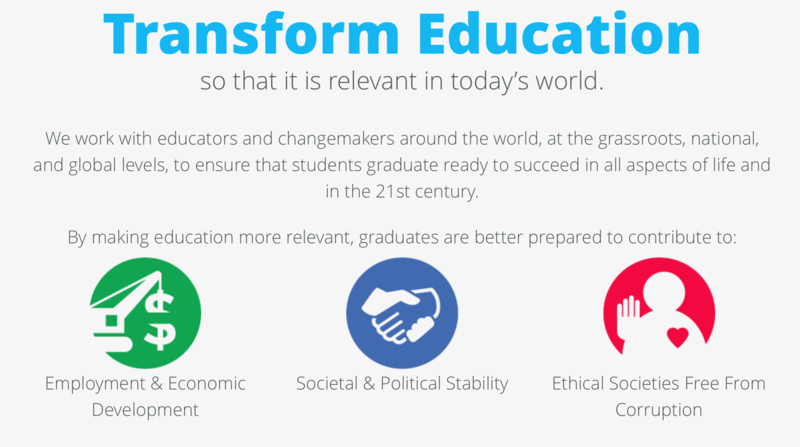 Through events, social media, advocacy and networking Global Peace Education, a division of Global Peace Foundation, is creating a global conversation on the need to transform education. With a positive, relevant and productive experience at school, students graduate better prepared for the twenty-first century world and economy. As innovative and ethical leaders they possess the competencies necessary to be successful in all aspects of life including a fulfilling personal and family life, a satisfying employment experience and responsible role as a citizen in the community. More employed, engaged, and ethical citizens will in turn contribute to real peace.